Arsenal duo Matteo Guendouzi and Alex Iwobi showed their class by responding to fans’ calls to duck down so they could get a better view of the Pierre-Emerick Aubameyang penalty against Manchester United. Watch this hilarious exchange below as fans shout at the players to duck down as they’re blocking their view ahead of this key moment in the game.
? Mattéo Guendouzi and Alex Iwobi duck down to let Arsenal fans have a better view of Aubameyang’s penalty ? 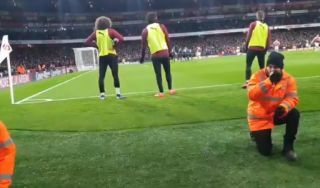 Aubameyang ended up slotting home his penalty, and Guendouzi and Iwobi were more than happy to listen to supporters and get on the floor while he did so. The Gunners ended up winning 2-0 in what could be a crucial result in this season’s race for the top four.